The harp has been recognized as a symbol of Ireland since the 13th century and was used on Irish coinage by kings John and Edward I. 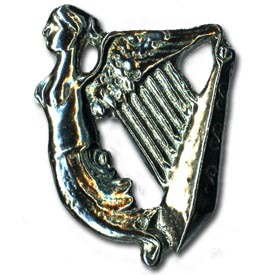 The harp was adopted as the symbol of the new Kingdom of Ireland established by Henry I of Ireland in 1541-42. Pewter, measures 1 11/16 by 1 1/4". Made in USA.